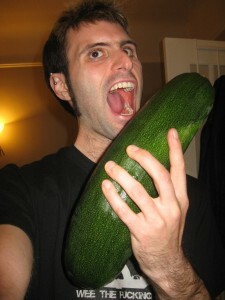 I grew a big-assed zucchini because I thought it was actually a butternut squash plant. For shame. I'm sorry, I look kinda awkward. woah BAM. that’s huge. my zucchini isn’t even flowering yet… I kinda like the growing of the gigantic veggies, it amuses me for reasons I cannot articulate.